Finished in 1941, sculptor Gutzon Borglum had turned Abraham Lincoln’s face, along with George Washington’s, Thomas Jefferson’s, and Theodore Roosevelt’s, into a physical site of memory by permanently carving him into Mount Rushmore. Built for a specific reason, Lincoln’s placement on Mount Rushmore tells one how the dominant memory remembers him and how it has been usable for different messages and contested throughout its time. The project was started when South Dakota State Historian Doane Robinson sent a letter to Gutzon Borglum in 1924, asking him to be the sculptor for carving in the Black Hills, South Dakota. The idea stemmed from the want of tourism in the remote state of South Dakota. Borglum’s reply was a yes. After getting two bills passed in Congress and South Dakota Legislature, the project was started. In promising the citizens of South Dakota that they would not pay for the building of the monument, Gutzon received federal funding after convincing President Calvin Coolidge and the United States Secretary of the Treasury for funding. It is now under the National Park Service. Lasting from October 4, 1927 to October 31, 1941, the production of Mount Rushmore took approximately 400 workers. Their work involved drilling, sanding down the granite, blacksmith, and dynamite. Regardless of the height, though, there was not a single death during the construction of the monument. Borglum died in March, 1941 and was survived by his son, Lincoln Borglum, who had supervised the construction of Mount Rushmore during the last two years. It is interesting to note that Borglum named his son after Lincoln, allowing the continuation of Lincoln’s memory to be remembered also in his son. Borglum did not shy away from this enormous feat and even thought the magnitude of it was fitting for the men. In making the monument, Borglum was quoted saying that he wanted to convey, “A serenity, a nobility, a power that reflects the gods who inspired them and suggests the gods they have become” . Borglum’s opinion of his creation is an apotheosis of Lincoln, elevating him to a divine status. In a way, Borglum did give Lincoln a god-like presence. Carving a 60 foot tall face of Lincoln into a mountain with an outwards gaze, Borglum literally made him a bigger than life presence that looks out over America. Thus, not only making Lincoln’s memory a permanent fixture on the American landscape but one that embodies godliness. With the optimal placement of the setting sun, Lincoln appears holy. An important part of Mount Rushmore is that Borglum has created it such that Lincoln’s memory is usable. Each man carved into the mountain was chosen for certain aspects of their life that Borglum agreed with; Lincoln being selected for preserving the Union. It was with Mount Rushmore that Borglum wanted to convey American ideals and wanted it to be the epitome of democracy. Borglum’s son, Lincoln, was quoted saying, “There on the mountain the sculptor has spoken eloquently with his art, an eloquence that says simply, “This is what it means to be an American!”” It is explicitly evident that not only did Borglum want to memorialize Lincoln due to his accomplishments in saving the nation but also wanted to convey a very clear message of American ideals through him. However, the image Borglum was trying to create with Lincoln is one that is very specific. He only aimed to honor and remember the work Lincoln did during the Civil War. More emergent memories of Lincoln have been used to convey different messages, though. Due to the Black Hills being given to the Sioux in a treaty in 1868 and being sacred land to them, the placement of Lincoln is one of tension. Featured below is a comic depicting Lincoln in favor of returning the taken land while the other three men look on with skeptical glances. It is no surprise that Lincoln was chosen to be for the rights of the Lakota (the minority) since he is so famously known for abolishing slavery. Lincoln depicted as supporting the Lakota. 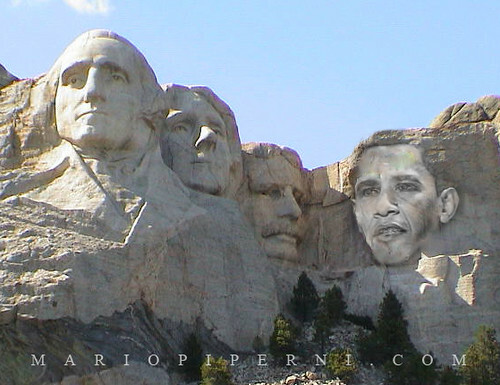 Obama replacing Lincoln on Mount Rushmore. This image of Lincoln as the man who abolished slavery is seen again in the image on the right. A very recent theme in political comics is placing President Obama on Mount Rushmore with the other four. The picture took this concept one step farther by replacing Lincoln with Obama, which was no random act. These two images remember and promote another side of Lincoln that is not a part of the dominant memory of Lincoln on Mount Rushmore. Nevertheless, this memory of Lincoln and slavery is also contested. A counter memory of Lincoln is seen in a pamphlet, created by the Nation of Islam, that was handed out to third graders in Tennessee, creating controversy with parents and teachers due to it challenging the dominant memory. The pamphlet, seen below, placed a quote by Lincoln that says, “I have no purpose, directly or indirectly, to interfere with the institution of slavery in the States where it exists. I believe I have no lawful right to do so, and I have no inclination to do so.” This is one of the very few items that offers a counter memory of Lincoln on Mount Rushmore and was greatly opposed. 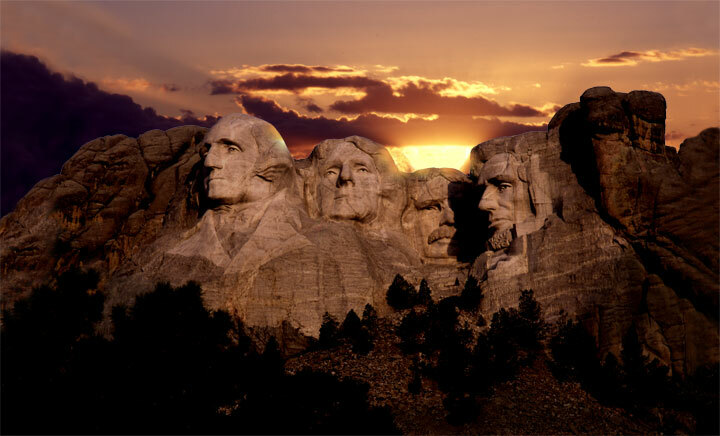 An interesting side note is Presidents Park in Lead, South Dakota, which is home to the busts’ of all the presidents. Lincoln has been moved from his permanent placement on Mount Rushmore to an interactive park an hour away by sculptor David Adickes. This park, now closed, took an official commemoration of Lincoln and made his memory vernacular. In creating this park, perhaps Adickes wanted to mend the detachment of Lincoln on Mount Rushmore from the public (in his literal distance and divine nature) by creating an approachable commemoration of Lincoln. Consequently, Lincoln on Mount Rushmore has been used to remember and to forget different aspects of his life for the 74 years he has been up there. Created by Borglum, a white man, and founded by white political leaders, Lincoln was meant to depict American ideals. And with his size and placement, Borglum did successfully raise Lincoln to a god-like status, while remembering Lincoln as the saver of the nation. However, Lincoln’s other qualities, like being the “Great Emancipator,” have been remembered but on the vernacular level. Lastly, the parts of Lincoln’s life that most try to forget (him not being opposed to slavery) have even been recollected due to his grand placement in the Black Hills. Overall, Lincoln’s placement on Mount Rushmore has allowed his image to be used for promoting American ideals while also becoming a place of contestation. “Biography: Native Americans and Mount Rushmore.” PBS. WGBH Educational Foundation, n.d. Web. 5 Apr. 2015. <http://www.pbs.org/wgbh/americanexperience/features/biography/rushmore- sioux/>. Boime, Albert. “Patriarchy Fixed in Stone: Gutzon Borglum’s “Mount Rushmore”” Chicago Journals 5 (n.d.): 143-67. Smithsonian American Art Museum. Web. 1 Apr. 2015. “Business Directory.” Presidents Park of the Black Hills South Dakota. N.p., n.d. Web. 16 Apr. 2015. <http://www.blackhillsportal.com/cdps/cditem.cfm?nid=10436>. “Carving History.” National Park Service. National Park Service U.S. Department of Interior, 9 Apr. 2015. Web. 1 Apr. 2015. <http://www.nps.gov/moru/learn/historyculture/carving-history.htm>. “Historical Letters and Legislation.” National Park Service. National Park Service U.S. Department of Interior, 11 Apr. 2015. Web. 1 Apr. 2015.<http://www.nps.gov/moru/learn/historyculture/historical-letters-and-legislation.htm>. Kirby, Doug, Ken Smith, and Mike Wilkins. “Presidents Park (Closed), Lead, South Dakota.” RoadsideAmerica.com. N.p., n.d. Web. 16 Apr. 2015. <http://www.roadsideamerica.com/story/9789>. “Memorial History.” National Park Service. National Park Service U.S. Department of Interior, 11 Apr. 2015. Web. 1 Apr. 2015. <http://www.nps.gov/moru/learn/historyculture/memorial- history.htm>. Perrottet, Tony. “Mt. Rushmore.” Smithsonian 37.2 (2006): 78-83. Web. 1 Apr. 2015. “3rd Grade Teacher Distributes Nation Of Islam Propaganda Portraying Presidents On Mt Rushmore As Racists [IMAGE].” LibertyNEWScom. N.p., n.d. Web. 16 Apr. 2015. <http://www.libertynews.com/2014/10/3rd-grade-teacher-distributes-nation-of-islam-propaganda-portraying-founding-fathers-as-racists-image/>. This entry was posted in Uncategorized on March 26, 2015 by Savannah Weeks. You’ve done great work! I like the flow of the post and how you cover the developing memory of Lincoln at Rushmore. We had talked about Lincoln’s apotheosis in class, but I think you did a really good job expanding on how Borglum’s work specifically promoted the divine image of Lincoln. However impressive the artwork is, I agree that the memory represented at the rock is incredibly partial. What was most interesting was how Lincoln’s placement on Mount Rushmore has become contested. I never thought how the individual memory of each president represented could be used differently to speak to present day tensions or ironies. I also found the Presidents’ Park really interesting. You did a good job analyzing this vernacular response and how it contests Mount Rushmore. I chose your page because at the Lincoln tomb (my page) there is a small bust of Lincoln also designed by Borglum. While Lincoln’s face certainly portrays solemnity and poise fitting for an American god, the consequence of the mythic tradition of rubbing his nose has turned the bust into a somewhat comic portrayal of the president. What was initially an official declaration of Lincoln’s majesty, has become the property of vernacular culture. It’s interesting to see how these two Borglum creations differ and I wonder what Borglum would say now about each. Anyway, you did a really great job! The links were cool too. I really liked that you included the correspondence between Borglum and the Historian because I’ve never looked at documents like that.